As readers might detect, I have a soft spot for highly derived taxa of obscure origins that appear to be perched atop long branches. Tarsiers, pangolins, Egkmowechashala, and red pandas are all favorites of mine, and behold the newest entrant to my heart: Ernanodon antelios. 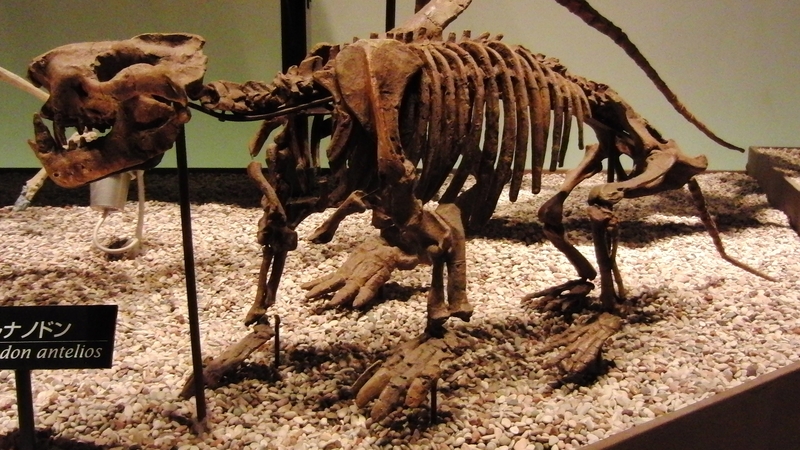 Ernanodon was named from a complete skeleton recovered in Guangdong Province, southern China, in 1973 (Ding 1979). The genus is monotypic, and so far known from only one additional skeleton discovered in Mongolia in 1979, but not described until 2012. Both specimens come from the Late Paleocene, around 62-56 Ma. Ernanodon was the size of a a “small dog” (Ding 1979) and remarkably robustly constructed throughout its skeleton, with large muscle attachments and a stocky, short skull. Its odd and highly derived anatomy have made both its phyletic origins and paleobiology subjects of considerable controversy. 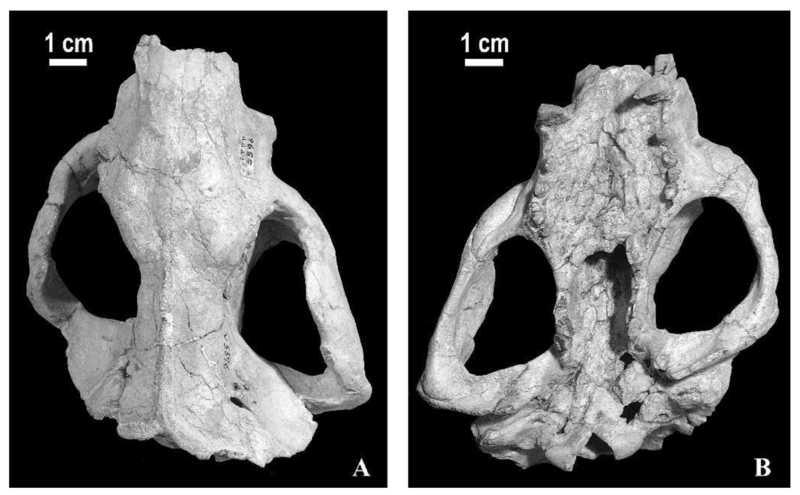 Cranium of Ernanodon antelios, from Ding et al. (2005). Ding placed Ernanodon in Xentarthra, the strange, mostly South American clade that includes armadillos, sloths, and anteaters (1979). What’s more, she identified it as the most primitive known Xenarthran, potentially rooting that group in East Asia. Xenarthrans are united by a unique, extra, “xenarthrous,” articulation on their vertebrae, and Ding argues that Ernanodon shows incipient development of this feature. The skeleton also resembles somewhat that of sloths in its body proportions and in aspects of the fine anatomy, such as the development of a second scapular spine and a “spout-like” mandible with reduced, peg-like molars (Ding 1979). Subsequent analyses have disputed this interpretation however. Many of the apparent xenarthran characters differ in detail from the genuine articles, and the skeleton is thought to more closely resemble that of palaeanodonts, a group of similarly adapted fossorial mammals from the Paleocene and Eocene of North America, Europe, and Asia (Rose et al. 2005, Kondrashov and Adadjanian 2012). This makes better biogeographic sense, as no other xenarthran, expect perhaps for the also enigmatic Eurotamandua, is known from outside of the Americas (Rose et al. 2005). Palaeanodonts are potentially collaterally related to pangolins (forming the larger group pholidotamorpha), which would fit Ernanodon into a large clade of Laurasian, fossorially adapted animals, several of which persist today (Gaudin et al. 2009). However, if cladistic analysis is the gold standard for determining affinities these days, Ernanodon has still only been analyzed in matrices which heavily sample either philodotomorphs (Kondrashov and Adadjanian 2012) or xenarthrans (Shaw 2010). An analysis with a broader representation of eutherian taxa may yet turn up some surprising affinities. 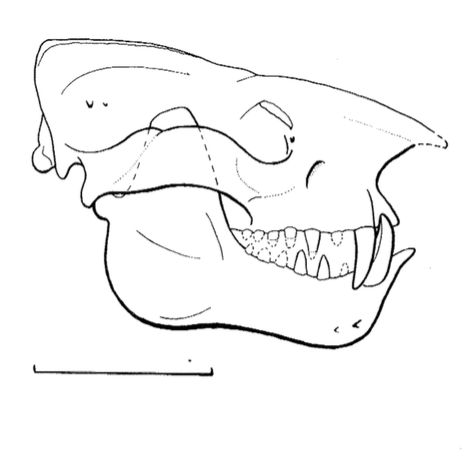 Reconstructed cranium of Ernanodon, from Radinsky and Ding (1984). Well apart from its controversial taxonomic affinities, reconstructing the paleobiology of Ernanodon has proved a puzzle. Its large temporal fossa and flaring zygomatic arch suggest powerful chewing muscles. However, this is paired with strongly reduced dentition, but for the enlarged canines. The position of the mandibular articulation with the temporal also suggest a relatively large gape, probably necessary to for the canines to clear each others’ tips (Radinsky and Ding 1984). Clearly, Ernanodon was capable of powerfully striking at something with these canines, but what? Its large claws and robust forelimbs, with generous attachment sites for elbow extensors, medial rotators, and digit flexors, suggest a digging habitus, possibly analogous to social-insect feeders like pangolins, anteaters, and aardvarks (Kondrashov and Adadjanian 2012). These animals all lose or strongly reduce their canines and chewing muscles, however (Radinsky and Ding 1984). Herbivorous sloths are similarly powerful chewers with enlarged caniniform teeth, but their posterior dentition is less reduced. Its unclear if Ernanodon could have efficiently processed much vegetation with its pointed, conical teeth. Radinsky and Ding (1984) suggest aardwolves as a possible analog. These myrmecophagous hyenas exhibit a similar level of cheek tooth reduction, but retain the canines and bite strength of their carnivoran relatives for defensive and social functions. This has been a brief visit with an OBSCURE EUTHERIAN, but hopefully informative. Next time probably really will be pantolestids. Ding, S. 1979. A new edentate from the Paleocene of Guangdong. Vertebrata PalAsiatica 17:57-64. Ding S, Wang B, Tong, Y. 2005. The type specimen of Ernanodon antelios. Journal of Vertebrate Paleontology 25:729-731. Gaudin et al. 2009. The phylogeny of living and extinct pangolins (Mammalia, Pholidota) and associated taxa: a morphology based analysis. Journal of Mammalian Evolution 16:235-305. Kondrashov P, Adadjanian AK. 2012. A nearly complete skeleton of Ernanodon (Mammalia, Ernanodonta) from Mongolia: functional analysis. Journal of Vertebrate Paleontology 25:79A. Radinsky L, Ding S. 1984. The skull of Ernanodon, an unusual fossil mammal. Journal of Mammalogy 65: 155-158. Rose KD, et al. 2005. Xenarthra and Pholidota. In The Rise of Placental Mammals. Rose KD, Archibald JD. Baltimore: Johns Hopkins University Press. Shaw BJ. 2010. The enigmatic anteaters, sloths, and armadillos: elucidating evolutionary relationships among xenarthran families, Ernanodon antelios, and remaining mammals. Dissertation. Portland State University.